It’s time for me to break the bad news…it’s virtually impossible to grow healthy seedlings at home in front of the window. When you do it this way you’ll likely end up with plants that are way too tall and stretched out (we call this leggy, and it’s not good). Seedlings need overhead light. And when they don’t get it? They’ll extend themselves towards the sun that’s coming through the window, which is how they end up leggy. A tall and skinny seedling is the opposite of what you want. Short, stocky, and strong seedlings are much more able to withstand the wind, rain, and other weather pressures they’ll face in the garden. If you’re going to spend the time and money to grow your own plants at home, I highly recommend doing it right and assembling your own DIY grow light stand. Growing under lights is the best way to ensure your seedlings are healthy and strong when they finally make that trip out to the garden. But, conventional seed starting equipment can be quite expensive. And for such a large investment it seems like a waste when they sit unused in a corner of the basement the rest of the year. The great news is that you don’t need one of those fancy light racks. You can easily assemble your own seed starting rack with materials from your local hardware and big box store. Come along on a tour of the DIY grow light stand I’ve been using for the last 12 years and learn how to build your own. I use metal wire shelving (commonly called metro racks) for my stand. 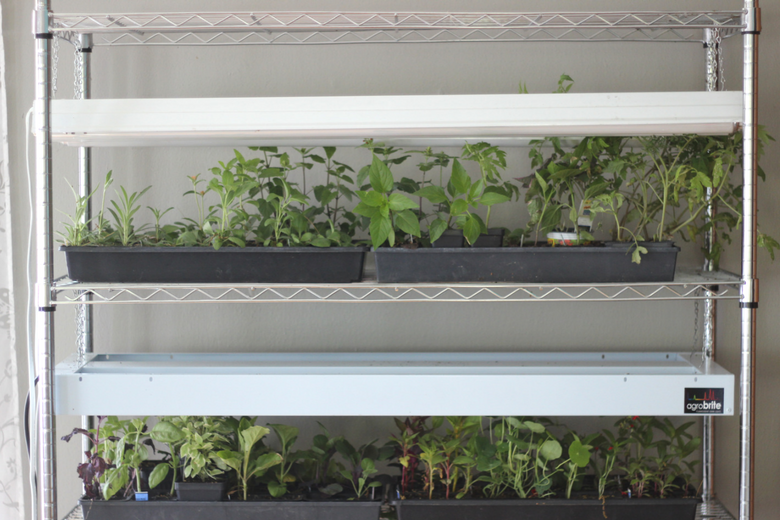 I grow a lot of seedlings, so I use the largest available which has five shelves. The rest of the year I use it for storage in my basement or garage. The shelving units come in different sizes, so you can choose one with fewer shelves if you have a small garden. There are lots LED and high performance grow lights out there, but you don’t have to get anything fancy if you don’t want to. Using standard 4 ft. long shop lights that hold two fluorescent bulbs works great. On each shelf, I use two sets of lights, so four bulbs total. I find that one set isn’t enough light for the seedlings and causes that leggy problem we talked about. I put three soft white inexpensive fluorescent bulbs and one grow light bulb in each set of four. I position the grow light in one of the middle two bulbs. The lights are hung with metal chains and s-hooks so I can move them up and down. The shelving unit, shop lights, bulbs, hooks, and chains are the main building blocks of this easy to build DIY grow light stand. Pretty simple, right? Once you get those things in place, there are a few other supplies you’ll need to continue setting up your successful seed starting operation. The nice thing is that most of these things are a one-time investment. You can use them over and over again every year. Your lights should be on for 12 hours per day and off at night. The easiest way to ensure this happens is to plug everything into a timer. You’ll need to plug all of your lights into the power strip and then plug the power strip into the timer so they’re all turning off and on at the same time. Depending on your set up you may need some extension cords to help all of the lights reach the power strip. I like to use bike water bottles because the stream of water is easier to contain than a watering can. That means so spills on my living room floor! Optional. The mat helps with the germination of heat-loving vegetables like peppers, eggplant, and tomatoes. I’ve found that I can’t successfully get pepper seeds to germinate without an extra bit of heat. Assembling your own DIY grow light rack will save you money and allow you to grow higher quality seedlings at home, which will also save you money! So, you’re saving money twice over. Not bad for a small investment. I’d love to show you around my DIY grow light stand. Get immediate access to a free video tour here.